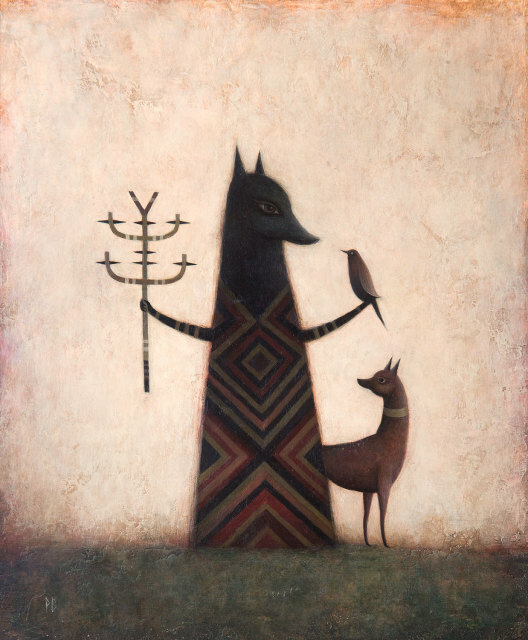 The work of Paul Barnes (b 1971) has a wonderous quality - weaving together nature and animals with the folklore of Barnes’ native northeast corner of Scotland and Barnes’ own tribal imaginings. The exquisite detail of Barnes’ work, its muted colours and a paint-surface that is reminiscent of fresco give his work an ancient feel that adds to its otherworldliness. The results are tender, allegorical and enduring. Paul Barnes studied at Grays School of Art, Aberdeen, BA (Hons) Design and has exhibited extensively in the UK and USA.